In Abu Dhabi people are used to seeing rare, unconventional cars on the road. In a country where petrol is cheaper than water, you can basically drive anything you please as long as you live there. 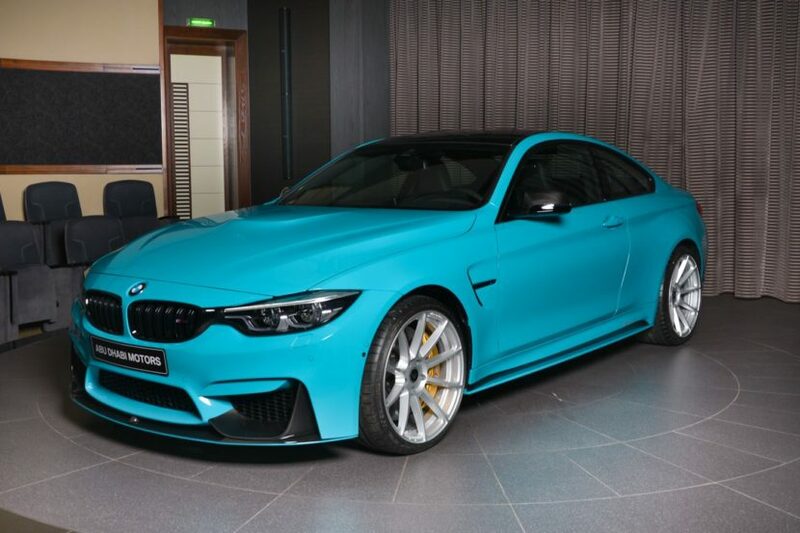 So having that disposable income, when one orders a BMW M4 chances are it’s going to be featuring some rather rare add-ons and a striking paint job. 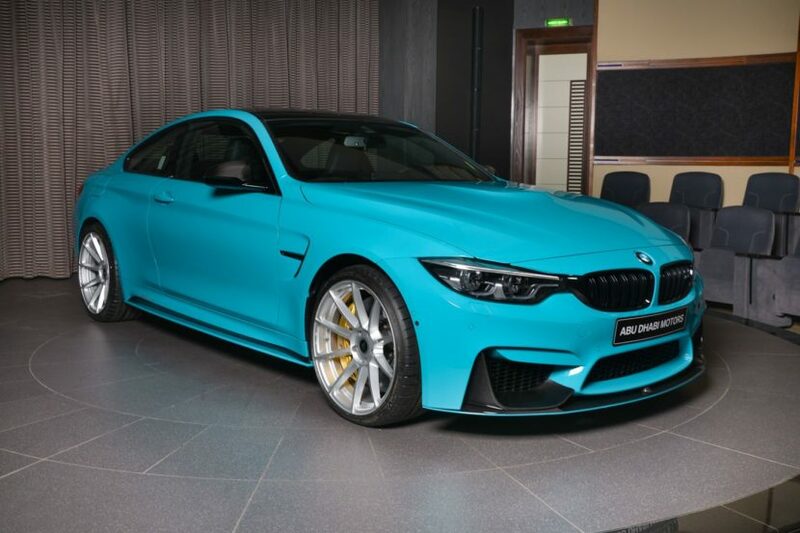 It’s exactly the case with this BMW, the M4 Coupe arriving at the famous BMW Abu Dhabi Motors dealer wearing Miami Blue, a rare color by all means, part of the BMW Individual catalogue. That’s just part of the story here though as the car also gained a few M Performance goodies, in the typical Abu Dhabi fashion. Up front you’ll notice a new spoiler attached to the bumper, along with a carefully painted stripe on the bottom, painted in Miami Blue. On the sides there are carbon fiber mirror caps replacing the standard ones while M Performance side sills decorate the M4, done in the same black-Miami Blue combo. From the side you’ll also notice the custom wheels from Vorsteiner, a touch we haven’t seen lately at the Abu Dhabi dealer up. The rear end houses a carbon fiber diffuser and four carbon fiber tailpipes from Akrapovic. Inside, the same blue theme continues, this time in the Fjord Blue hue, as in the anniversary M3 30 Jahre model. However, unlike on the M3, the same color and Merino leather has been applied throughout the cabin, from the dash to the door panels. 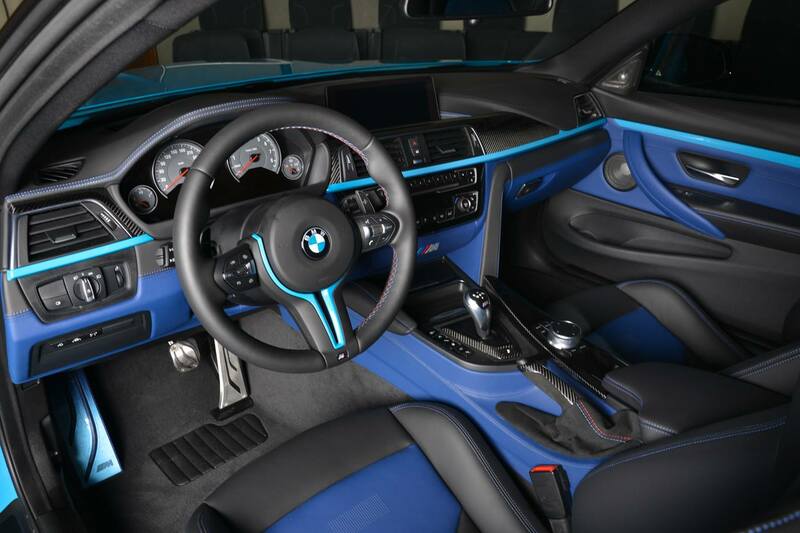 The trims are mostly done in carbon fiber with a notable exception for the Miami Blue highlights on the dash.